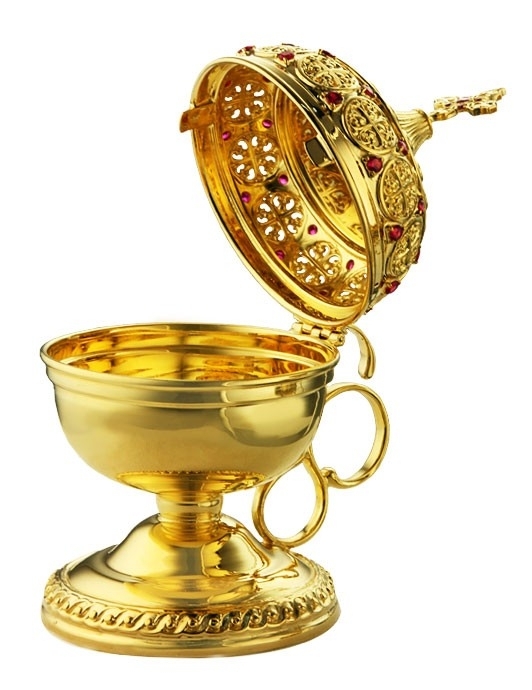 Jewelry hand censer - 4 - Istok Church Supplies Corp.
A nice Russian-made Orthodox church hand censer is made of brass exclusively by hand. The surface is covered with hih quality gold-gilding. The lid of the censer is decorated with vegetative ornament with inserts of high quality cubic zirconia stones. The censer has a comfortable handle. The product is packed in a presentable packing of man-made leather with a velvet loom. Dear Istok! The Vestments arrived to day. I would like to say the workmanship is extraordinary! Even for such inexpensive vestments it is obvious that a lot of love and care went into making them. Thank you! Received my cassock and I love it. I did have to re-sew a button, but it is very well-made and comfortable.